KBShimmer 6th Anniversary LE polish Set, Nail Art, and Contest! Good evening, dear readers! I am really excited to share with you the new Limited Edition Beach Trio by KBShimmer created to celebrate their 6th anniversary. The trio launches August 1st, and you're definitely going to want these! 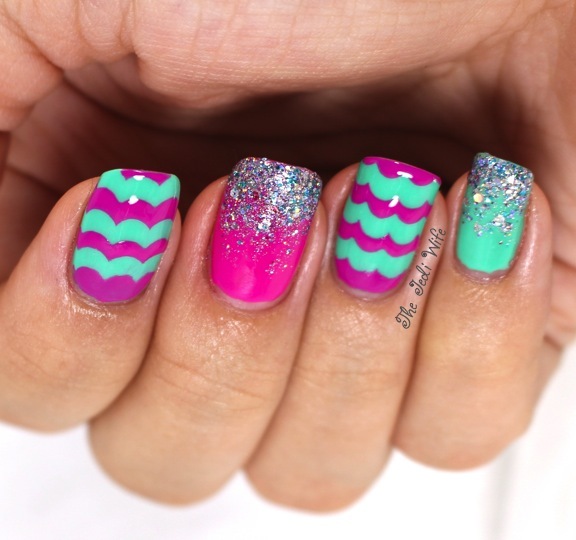 Beach Please: A bright, near neon pink cream with purple leanings. Beach Please is perfect for long summer days on the water. Covers best in 2-3 coats. Hexy Bikini: The latest addition to the KBShimmer textured polish line, Hexy Bikini combines holo glitters in silver, teal, and pink and reflects beautifully under the light of the sun. It’s perfect in two coats. 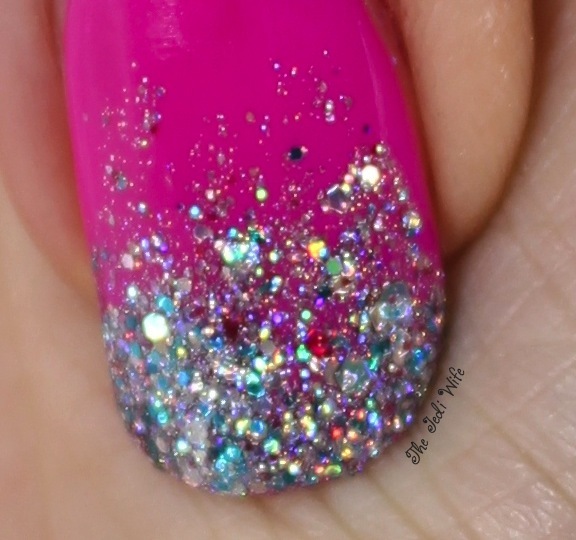 Add a topcoat for even more sparkle. Shore Thing: Escape to tropical waters with this bright aqua-mint cream with blue-green undertones. Covers best in 2-3 coats. Shore Thing is so beachy, you’ll feel like you’re in a tropics no matter where you are. I really wanted to do something fun using this trio, and I decided the new scallop-shaped vinyls made by KBShimmer would be perfect to go with the beach theme! The layering of Beach Please over Shore Thing made it look a little more purple on the nails than it really is. My middle finger shows the true pink colour in two coats. I topped my nails off with Clearly on Top Quick Dry Top Coat. Because of the textured finish of Hexy Bikini, I needed two coats on my pinky and middle fingers. All three of these polishes applied really easily for me, and I am extremely impressed with these creams! The only issue I had with this manicure came with using the vinyls. They applied easily enough, but when I peeled them off, they pulled the Beach Please and distorted the shape slightly. It is likely that it was my fault and I didn't remove the vinyls fast enough as polish was starting to dry, hence the issue. I still really like how this manicure came out! Here's a closer view of the polishes. 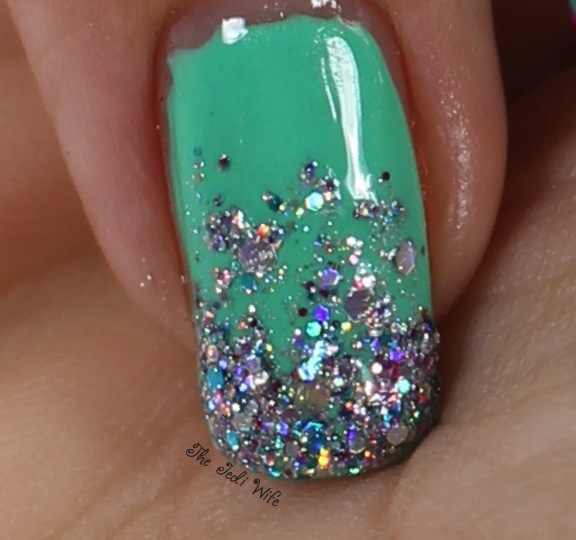 Check out that holo glitter! As I mentioned previously, the Limited Edition Beach Trip launches August 1st. The two creams retail for $7.50 each, the textured polish for $8.75, and will be available at www.HarlowandCo.org and www.KBShimmer.com. For a limited time, this trio will be available for $21, only at www.KBShimmer.com. To celebrate the polish line's 6th anniversary, KBShimmer wants you to enjoy the summer with a beach themed giveaway pack! One lucky winner will win a KBShimmer Summer Prize Pack! This pack includes an Amazon Kindle Paperwhite with a $25 gift card, the beach trio polish set, a set of nail vinyl sheets, lotion, a sugar scrub, a polka dot towel and a large beach bag. Now thats a fun prize! The rafflecopter to enter is located here in addition to the rules. Good luck! I'd love to hear what you think about this trio! I absolutely love these colours together!